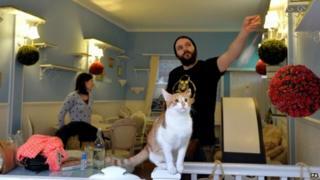 London's first cat cafe has opened to such a huge demand that it is fully booked for its first two months. Following a crowdfunding campaign which saw more than £100,000 raised, Lady Dinah's Cat Emporium opened on Saturday in Shoreditch, east London. Since then, the online booking system has crashed and it is fully booked until May. Owner Lauren Pears said the cafe itself had been "calm on the inside, crazy on the outside". "We're hoping people won't get too cranky with us - we weren't expecting so many people to get in touch," she said. Before the cafe opened, the Cats Protection charity raised concerns about the animals' welfare. Maggie Roberts, Cats Protection's director of Veterinary Services, said: "We are concerned about the implications of having a number of cats in a limited space with groups of people unknown to them coming and going throughout the day. "We believe this kind of environment is not suitable for domestic cats because they have evolved as solitary animals and generally do not choose to live in social groups - unlike dogs which are a social species." But Ms Pears said the 12 cats - which were donated by people who were moving abroad and could not take the animals with them - were so far not showing any signs of stress. Ms Pears also said some which were previously shy were now thriving. "They go away and come back for attention when they want it," she said. "They can have rest time when they want to. They really don't seem to be fussed at all." An independent veterinarian and a cat behaviourist will visit the cafe regularly to monitor the animals and to monitor any signs of distress. Entry into the cafe is staggered over 15 minutes so as to not overwhelm the animals. "We want to keep an eye on them, as we need to take a long time to make sure this is working," said Ms Pears. Cat cafe purrfect for petless Londoners?